1. E-cigarettes work by heating up flavored liquid into a vapor. This liquid used in an e-cigarette is most commonly called ‘e-liquid‘ or ‘e-juice’, however some people just call it ‘juice’ or ‘liquid’, and others ‘e-cig liquid’. It can be be purchased with or without nicotine. This liquid is available in many flavours (we sell over 50) and many nicotine strengths (we have 5 nicotine options), but regardless, the ultimate goal of any e-cigarette is to heat up liquid into a vapor. In order to heat e-liquid into a vapor, all e-cigarettes have 3 things. 1. A battery. 2. A heating element 3. An area for liquid to go. That’s it, that’s all folks. No matter how fancy or intricate the e-cigarette looks, or how large or how many buttons are on it, how an e-cigarette works is relatively simple. The liquid goes to the heating element, the battery warms up the heating element, and vapor is produced. You just fill your e-cigarette with liquid, and the rest is simple. a) E-cigarettes produce a simulated smoke called a vapor. To the untrained eye, the vapor produced looks like smoke, but it is not. It is a vapor, similar to that used in fog machines at concerts. In all current studies done on the vapor (or second hand vapor), the vapor produced is safe. c) E-cigarettes allow users to cut down gradually their nicotine consumption. While this is not for everyone, many users start weening themselves off the nicotine altogether through e-cigarettes. Many customers report starting with a higher nicotine strength e-liquid, and slowly over time dropping down the nicotine levels in their e-liquid until it is completely nicotine free, or very low levels of nicotine. That is really all there is to it! Now you know the answer to the question: How do e-cigarettes work! 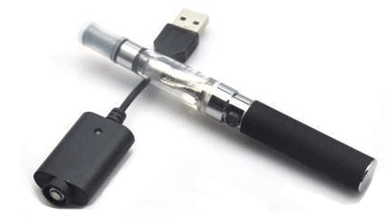 If you are interested in purchasing an e-cigarette, please visit our online e-cigarette store. We also have a retail store in London, Ontario. You can also call us anytime toll-free at 1-844-286-VAPE, or contact us online!